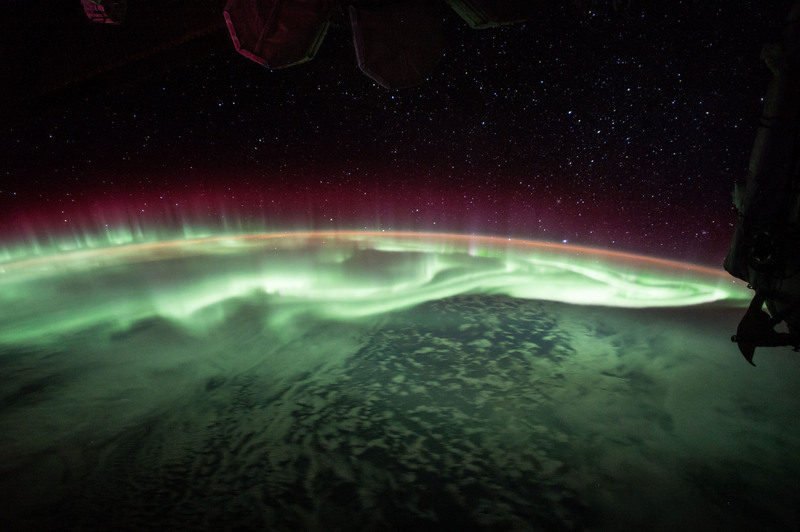 Explanation: Like salsa verde on your favorite burrito, a green aurora slathers up the sky in this June 25 snapshot from the International Space Station. About 400 kilometers (250 miles) above Earth, the orbiting station is itself within the upper realm of the auroral displays. Aurorae have the signature colors of excited molecules and atoms at the low densities found at extreme altitudes. Emission from atomic oxygen dominates this view. The tantalizing glow is green at lower altitudes, but rarer reddish bands extend above the space station's horizon. The orbital scene was captured while passing over a point south and east of Australia, with stars above the horizon at the right belonging to the constellation Canis Major, Orion's big dog. Sirius, alpha star of Canis Major, is the brightest star near the Earth's limb.